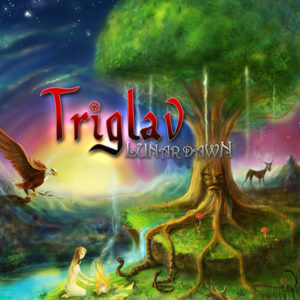 Triglav is the new conceptual release from Neogoa and the Croatian duo Lunar Dawn featuring three new tracks including collaboration work with Amir John Haddad (a touring member of Juno Reactor). Since the release of their debut album Kolovrat back in 2015, Lunar Dawn wanted to make something really special, more diverse, unusual but staying true in terms of ethnodelic motifs, melodic aspects of the trance sound, and of course, continue the story of Kolovrat mythos, but keeping all elements tight and psychedelic enough. All tracks written and produced by Kristijan Ilišinović and Saša Prečanica (Croatia). Bouzouki on track #2 by Amir John Haddad (Germany/Spain). Artwork illustrations by Arkadiy Tronets (Russia) with additional editing by Ivan Parić at Neogoa Design (Croatia). Mastering by Igor Čeranić at Deimos Soundlabs (Croatia). MP3 Download | FLAC Download | WAV Download · Download count: 8,009. Released under a Creative Commons license for noncommercial usage. Special notice: this release is available on Neogoa’s Bandcamp page as a limited digipak with 4 additional bonus remixes by Proxeeus, Lectro Spektral Daze, Journey Into Sound, and Dragon Twins. Awesome work guys, really ! I’m here again to express my opinion that folk music and psytrance don’t match. I love them both, but in combination it is too much like adulteration. With all due respect to the musicians. In any case, we support all that gave it a try and saw no joy of it, as we also support all those who tasted and loved it. Critics make artist go further and beyond regular. Thank you for downloading in any case, thank you for listening, and thank you for being part of Ektoplazm platform, if you can – donate and help Basilisk to run it further as it stands on thin ice atm. Forgive me, I take my word back! Listened to it second time, and loved it! One of the better psy/goa releases as of late! Strange that I had even had these thoughts, always loved folk music, and missed having multiple genres at parties. I guess we may all be possessed some times, huh? so amazing o man. My favorite music is the hybrid sounds and this is perfect perfect medicine for me! Really nice release! Even better than Kolovrat, I think. Very Nice. Track 01 (Jav) is Perfect. Goa Turkish motive? It’s still quite the Amateur. Ancestral Goa is India style. Not for me, sorry but a maximum of 2 stars. goatrance is modern neotribal music and the concept was highly eclectic from the beginning….it has no nation and roots in every countrys tribal music…i love it! wonderful sounds of bouzouki and trance….